Today was really nice day. My Mom and I went to the Pacific Orchid Exposition in San Francisco. We set out around 9am and stopped by Subway to get a footlong sandwich for lunch. When we got to Fort Mason—where the venue was—it was difficult to find parking. There were tons of empty parking spaces, but because it was the weekend, around 40% of the spaces where reserved for people with marina license… which was annoying, because there were like a hundred spaces that was empty. I had to circle twice and park about a mile walking distance. I was worried that my Mom would have a difficult time walking, but luckily the weather was nice—nice enough to remove my jacket—and we enjoyed looking at all the plants along the sidewalk and parking lot. The Expo was really nice as always, but because it was Saturday (we normally go on Fridays), there were a lot of people… so I found it hard to snap photos right away. I had to wait patiently for people in front of me to finish looking at the display, before I can move closer. Dispite all the people, it was nice seeing a lot of amazed looks, especially from people who I assumed were first timers. It was hard not to smile a lot. There were die-hard photographers who had expensive cameras, tripods and remote flashes. I noticed that there were a lot more people who had DSLRs (with varying degrees of experience). There were also a lot of point-and-shooters. I heard a few people saying things like “I didn’t get that shot” or “It was blurry”. I actually offered to show a couple people how to turn on the macro setting. I was rewarding hearing them tell me that their photos looked a lot better. I initially thought I would use my macro lens, but I found that it was easier to use my zoom lens, since I had to stand back a lot of times. I took quite a few photos, and hopefully they turned out well. I’ll post the photos in a separate blog entry and most likely a slideshow. After seeing the exhibits, my Mom and I went out to a bench, sat and had our lunch, before we embarked on the sales area. My Mom commented a lot that there were more exhibits and more orchids. To me, it seemed like there were the same amount, or even slightly less, but I think the increased number of people, maybe it made it seem bigger. 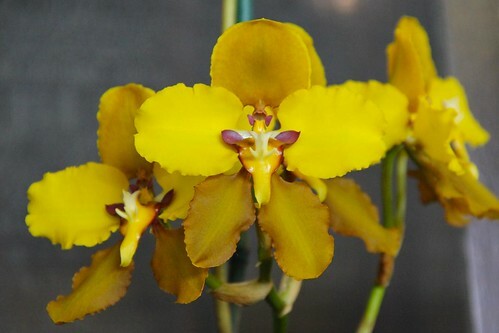 When we walked through the sales area, I found that I didn’t find much Orchids that I wanted to buy and was content on soaking in all the varieties and trying to pick up what will do well outdoors in our area. I wanted to get more Masdevallias, but I didn’t see any that caught my eye… well, I should say… I didn’t find any that caught my eye at an affordable price. There was one I really liked, but I didn’t want to pay $85 for it. My Mom was really enjoying seeing all the Orchids and I could tell that she wanted to get a couple, so she was scoping for cheap ones. I encouraged her to get an Epidendrum Wedding Valley “Sakura” (I think that’s was it was) that she was eyeing because it was only $15 (cheap, compared to all the other Orchids at the show). We nicknamed this the Lollipop Orchid, because the flowers were in a cluster at the very tip of the tall plant. It was said to be easy to grow indoors and out… and “grows like a weed“. We also stopped by the area where they cut and divide big plants (mostly Cymbidiums) and sell them as bare roots. My Mom wanted a green one, but we didn’t find a true green variety, so she settled for a yellow-green one call Cymbidium Sleeping Beauty ‘Inca Gold’. We then watched a demo on how to divide a large Cymbidium and I actually learned a lot. One thing was that it’s better to use a smaller pot than one that too big for the Orchid. This way there is less medium and it can drain and dry out easier. If the pot was too big, it may have the tendency to retain too much moisture, especially in the center and lead to root rot, which he showed us on a big pot where there were no roots in the middle and all the healthy roots on the outside where they were able to dry out a bit between watering. I also discovered that when you divide an old Cymbidium, you can save the old pseudo bulbs if it’s firm and plant it and get another plant. With all my rooting-various-plants experience, I don’t know why this never came to mind. Duh? So this summer, my Mom suggest we divide our existing Cymbidiums to smaller pots, which we we planning even before the show. After visiting all the booths, and not purchasing any Orchids for myself, I returned to one vendor where I eyed a couple cheap Orchids. I got a Epidendrum Wedding Valley “Yukimai” (“Excellent Patio Orchid”) which I think I will plant with the Epidendrum my Mom bought. I also got a Dendrobium White Grace “Sato”, which the sign says was a “good beginner’s choice” and “cool growing”… although it also said “warm growing” on another sign. Finally, I got a “Ultra-Mini Cymbidium” that I knew my Mom wanted to get call Cymbidium Sweetheart “Elegance”. We finally got out of the Expo around 5pm… Dang! We spent almost 6 hours there!… It was still nice out and we headed back to the car, walking slowly (aching feet). My Mom liked the exercise, but I think she was getting tired, so I told her to sit and rest a couple times on our walk to the car. 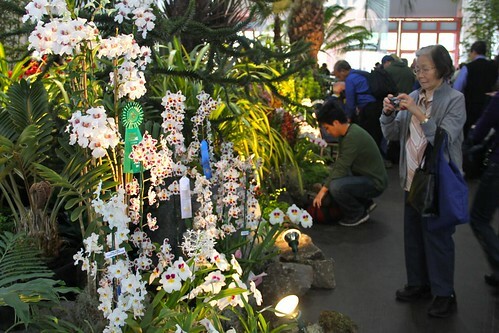 This entry was posted in Friends and Family, Gardening and tagged cymbidium, Dendrobium, Epidendrum, fort mason, masd, nanay, orchid, Pacific Orchid Exposition, san francisco. Bookmark the permalink.